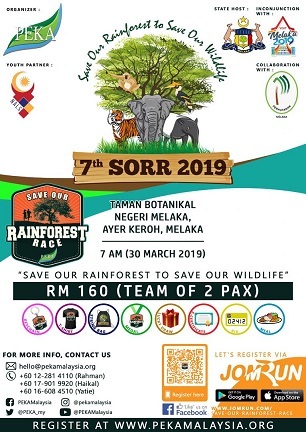 PEKA is hosting its 7th Edition of Save Our Rainforest Race (SORR) 2019, 30th March 2019 at Taman Botanikal, Ayer Keroh, Malacca. Register now at JomRun app! An eco fun walk with Nature .Objective is to plant a tree with lots of activities.